I'm new to all of this but I'm desprate to find help for my hair. I'm having a serious problem with it. Not only is it really fine, but it is severely damaged. I've never had really long hair...I don't know how to do it. 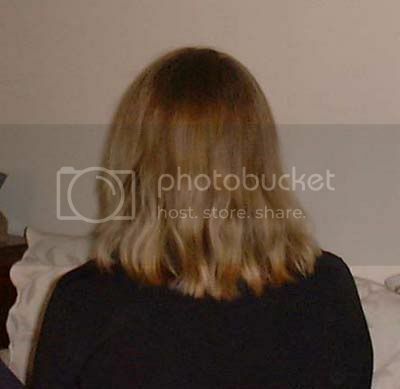 My thin hair was once in pretty good shape, maybe a half inch or so past my shoulders. The longest it had ever been. I made the mistake of cutting it because I thought I wanted layers. This was almost a year ago and it has been in awful shape ever since. I am currently trying to get my hair in a healthy condition and possibly grow it out. It seems that everytime I go get it trimmed to get the split ends off it just gets shorter and shorter. Is this because I'm not getting my split ends cut soon enough? Is it possibly for me to ever have really long hair? I need help! Nothing seems to be working. It seems silly, but I have cried because of my hair on many occasions. Its in terrible shape. It is depressing to see pictures of when my hair actually looked normal. Hi Jess, and welcome to LL!!! First, I believe that everyone can grow their hair!!! You have come to the right place for advice!!! The people here are great!! So YES, you can grow your hair with good care and patience!! I too have very fine hair and I color it (not ready to be gray yet) plus I am on medication that affects my hair. Thanx to the advice here, I am growing my hair...slowly but surely (21 inches so far) and it is healthy. As for damage...that you cannot fix...you have to cut damaged hair off. My question here is, does your hairdresser know what she/he is doing with regard to split ends. I used to have a hairdresser that cut my hair off telling me I had split ends. Frankly, I think he just liked doing cute little bobs and stuff so that was his line to get me to accept it. I mean, you are using a satin pillow, you are not washing everyday and you don't use heat appliances (I assume that includes a hair dryer) so you are doing a lot of things right!!! Pls tell us about your hair care regiment. Tell us what you use, how often, do you deep condition, etc... That will help the more experienced people to give you ideas. Again, welcome to LL. Take care. I had all of my split ends cut last week and now Im just looking for help and encouragement on growing my hair out. I want long hair, but it is so many different lengths... it is going to take some time I assume. I guess I should probably work on getting my hair healthy first. I am using Loreal Paris Pro Vive Shampoo and Conditioner (for damaged hair) and no, I am not even using a blow dryer. I also use a spray in conditioner after i get out of the shower. I just started this process maybe a week ago.. I know I have to be patient, I just need reassurance that there is still hope to get my hair back in good condition, even if it takes a while. I'm also taking a skin, hair and nails vitamin. Am I wasting my money, or do you think they work? First of all, BIG HUGZZZZ to you for the emotional stress that the damage to your hair has caused you. I also have very fine hair and am in the process of growing out severe damage. So I know what it's like to have hair that was once silky and healthy become split end city. Not a fun place to be, is it? Secondly, thank goodness that you switched stylists! Your previous one obviously didn't know that layers are a terrible idea for fine, thin hair, as it only makes what little hair you have look even thinner...and wispy and just awful. They also obviously didn't know that using any sort of razor is a one way ticket to split ends. Good call in not wasting your money anymore on someone who doesn't know what they're doing when it comes to hair. It sounds as though you're already doing a lot of the right things in terms of hair care. Satin pillowcases are lifesavers for fine haired people like us (never ever EVER sleep on flannel - promise me!). Never using heated appliances or styling products is also a huge help. And leave-in conditioner is essential, so you're right on the money there. What I have discovered recently is that doing "seek and destroy" missions on my hair, one strand at a time has drastically reduced the appearance of damage. I just isolate one small strand of hair and pin the rest out of the way. Then out of that small strand, I pick out the individual ends that I can see are damaged and cut them off, usually about an inch shorter. It's terribly time consuming, but well worth it in terms of saving the healthy hair that I have. Also, I have stopped wet combing altogether, as I believe that may have contributed to some of the damage. Now I just work a leave-in conditioner of some kind through the length of my hair and comb it only after it's completely dry. Fine hair breaks easily, so any little thing that you can do to lessen the impact to your hair will help. You've definitely come to the right place for help and encouragement in growing your hair out. Just look around (I recommend the Ultimate Guide To Growing Long Hair for starters) as there's a wealth of tips and info all over this site and these boards. Best of luck. Thanks so much for the advice guys!! I feel a little better!! and yes, it is an awful place to be... alot of people don't understand why I get so upset about my hair... but those people have nice thick strong hair.. I don't, so it takes an extra effort to get it in good shape. I hope to see a significant improvement in 6 months to a year. I'm crossing my fingers that if I carefully follow all precautions and advice on this site that I will be successful! Hi Jess! Welcome to LL! Please feel free to explore the boards here and ask as many or as few questions as you'd like. We are all here to learn from eachother and give our own thoughts,experiences,what works and doesn't work for each person's individual hair needs. I also have baby-fine hair. It is now 29 inches long. I think the main reason I have gotten it this long, and in as good of shape as it is, is that I do not comb or brush. I just get too much breakage when I do. This has made a huge difference. The only time I comb or brush is before trimming or before taking a picture. Long time hair twin of mine! I was brushing for a while and I am pretty sure that was a mistake. I do use a wide toothed smooth comb some but I am stopping all wet combing. I haven't seen any splits but my hair is not growing as fast as it usually does. What you said is great advice. Fine hair really is like delicate lace and must be treated as such. Nice to hear from you, Strawberryfine! How have you been? My hair also seems to be kind of stalled at this length. My goal was waist, so I'm happy even if it doesn't get longer. Tailbone would be nice, but I think that's it for me. When my hair severly damaged I was advised by several people to try Aveda's Damage Remedy Intensive Structuring Shampoo & Conditioner treatment and it really saved my hair! I strongly recommend this product. The others have given great advice- and satin pillowcases are a must in my opinion! I haven't used a blow dryer in about 4 months and when I do I use a diffuser or cool setting-As for curling or flat irons- no-no-never never!! !